Join Us for A Week of Celebrating! 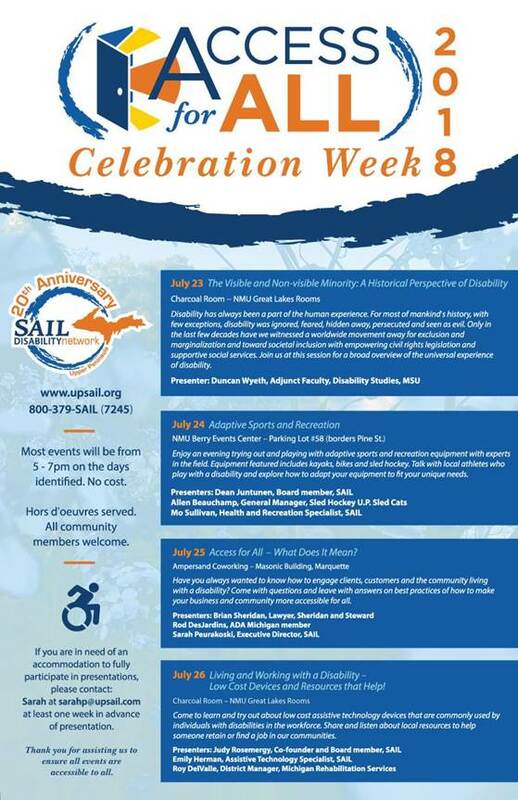 20th Anniversary SAIL, Disability Network of the U.P. Most events will be from 5 – 7pm on the days identified. No cost. Hors d’oeuvres served. All community members welcome. If you are in need of an accommodation to fully participate in presentations, please contact: Sarah at sarahp@upsail.com at least one week in advance of presentation. Thank you for assisting us to ensure all events are accessible to all. Disability has always been a part of the human experience. For most of mankind’s history, with few exceptions, disability was ignored, feared, hidden away, persecuted and seen as evil. Only in the last few decades have we witnessed a worldwide movement away for exclusion and marginalization and toward societal inclusion with empowering civil rights legislation and supportive social services. Join us at this session for a broad overview of the universal experience of disability. Enjoy an evening trying out and playing with adaptive sports and recreation equipment with experts in the field. Equipment featured includes kayaks, bikes and sled hockey. Talk with local athletes who play with a disability and explore how to adapt your equipment to fit your unique needs. July 25th: Access for All – what does it mean? Have you always wanted to know how to engage clients, customers and the community living with a disability? Come with questions and leave with answers on best practices of how to make your business and community more accessible for all. July 26th: Living and Working with a Disability – Low cost devices and resources that help! Come to learn and try out about low cost assistive technology devices that are commonly used by individuals with disabilities in the workforce. Share and listen about local resources to help someone retain or find a job in our communities.